Spinach is a great item to always have in your refrigerator! 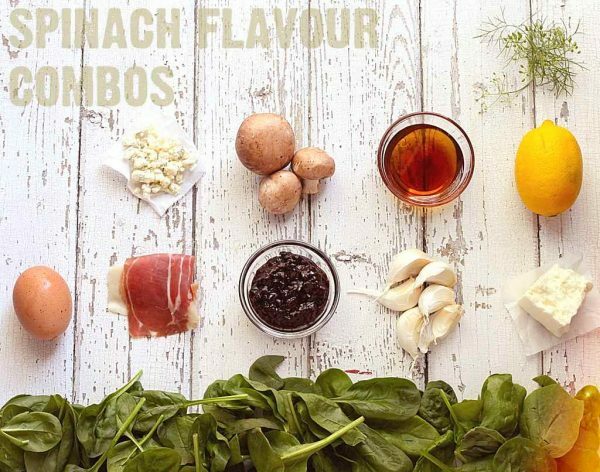 With a flavour that is much milder than other dark leafy greens, spinach is incredibly versatile. Try it raw as a base for a salad, your choice green for fresh juice or smoothie, chopped and added to omelettes, or steamed alongside your favourite dish. 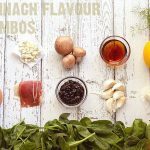 What makes it even better is that it packs a punch when it comes to iron, as well as vitamins A and C.
There are three typical types of spinach, but most people only ever see spinach in bunches, bagged crinkly leafed mature spinach, or flat leaf baby spinach. The three varieties are actually savoy spinach, smooth flat leafed spinach, and semi savoy spinach. 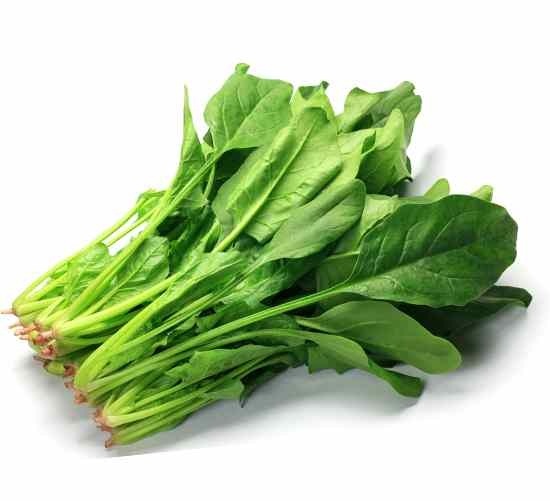 Savoy spinach is the crinkled leaf spinach that is most commonly sold in bunches at the supermarket. Smooth leaf spinach is typically used for processing because they’re easier to clean and process. Semi-savoy spinach is a hybrid of the two: with slightly crinkled leaves that are still fairly easy to clean. Whether the spinach you buy is flat and brightly green or deep green and crinkly, spinach tastes delicious! Baby spinach, identified by the young, tender leaves are ideal for eating raw. Look for thin, flexible stemmed spinach leaves with smaller, soft leaves. For dishes calling for cooked spinach, the more mature, larger-leaved spinach is a great choice. Look for deep green leaves that are tender, and avoid leaves that are discoloured, limp or wilted. Make sure you wash spinach well as grit and sand gets stuck amongst the leaves. The best way to do this is to give it a soak in a bowl or in a clean sink (swishing it around a few times) or with a salad spinner. Spinach is best stored when wrapped loosely in paper towel and then in an open plastic bag in your refrigerator. When stored this way it will last from 4 to 5 days. Wet spinach tends to spoil faster, so be sure to only wash it right before you use it. Spinach can be chopped roughly, stacked and thinly sliced, torn or left whole. 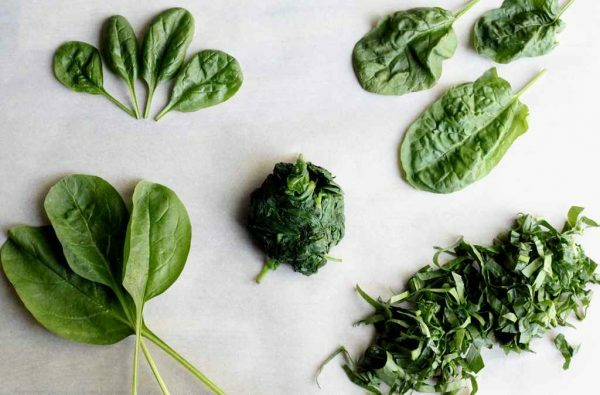 Depending on how mature the spinach is, you may need to remove the stem from the spinach leaf, which can be woody in texture. Simply fold the leaf along the stem and tear from the stem at the base of the leaf. Spinach leaves can be steamed, sautéed, used in a stir-fry, added to pasta or soup dishes, or combined with eggs. The options are endless! Next time you are sautéing your spinach, try adding a little garlic, ginger, sesame oil or lemon as a flavour boost! 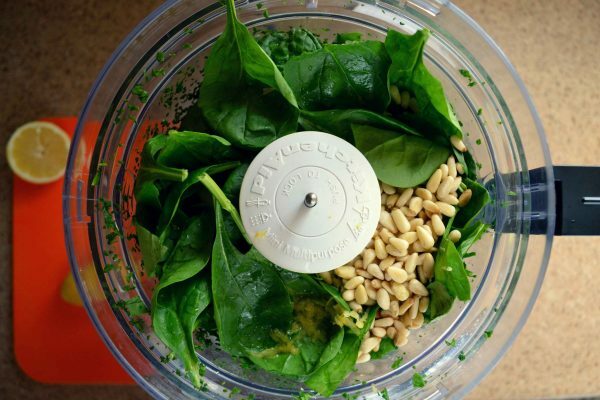 1 pound of fresh spinach will yield 10 cups of roughly chopped spinach and 1 cup cooked. You’d be surprised at how much green goodness you can get in a small portion of cooked spinach, but always buy more than you think you need since it cooks down so much. We agree with Popeye that there is no such thing as too much spinach! Spinach freezes well. 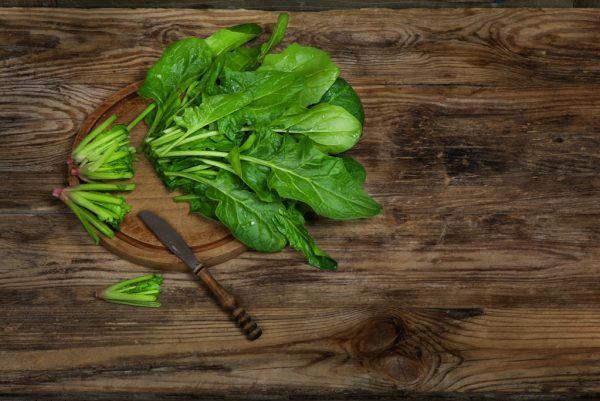 Start by washing the spinach well before blanching in a boiling pot of water for about 2 minutes. The leaves will turn a bright green and wilt quickly. Drain and quickly plunge into a bowl of ice water to halt the cooking process. Squeeze out any excess water over a sieve and separate the spinach into bunches or blocks on a large baking tray. Flash freeze, then transfer to an airtight bag and squeeze out all the air to help prevent freezer burn. Store in freezer and use within 10 months. You can use frozen spinach in dips, omelettes, smoothies, or soups and stews! Spinach dip is super easy and delicious to make! 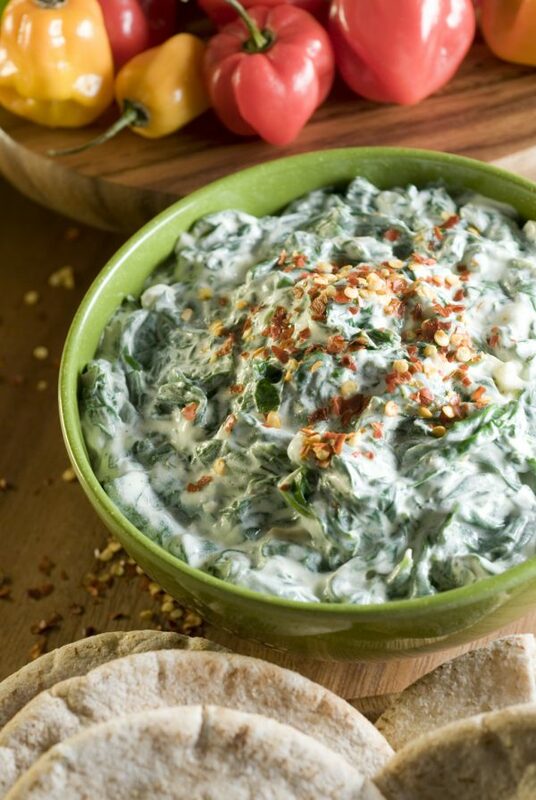 Nobody can resist spinach dip, especially when it’s made with extra cheese! In a food processor, try blending a block of cream cheese, 1 small chopped onion, a bit of milk, and ¼ cup grated cheese of your choice (if you are stuck, white cheddar is yummy). Mix in about a cup of chopped, cooked and drained spinach and transfer to a baking dish. Top with cheese and bake for about 30 minutes at 350°F to make irresistible spinach dip that will be a hit at your next party. Try serving it with carrots, celery, pita, or pumpernickel bread. You can even scoop out the pumpernickel bread, put the pulled out pieces on the side and serve the dip inside the bread bowl. Spinach drastically decreases in volume when cooked. 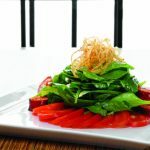 For example, 10 ounces of baby spinach will produce 4 raw side salad servings; the same 10 ounces of baby spinach when cooked on the other hand will only yield 2 to 3 servings. This is something to consider when you decide how much spinach to buy. Need a quick meal and only have canned pasta sauce? Add some spinach, fresh chopped onion and some mushrooms in a pan and give it a quick cook before adding in canned pasta sauce. This will bring “store bought” up to the next level. Convenience can be healthy too! 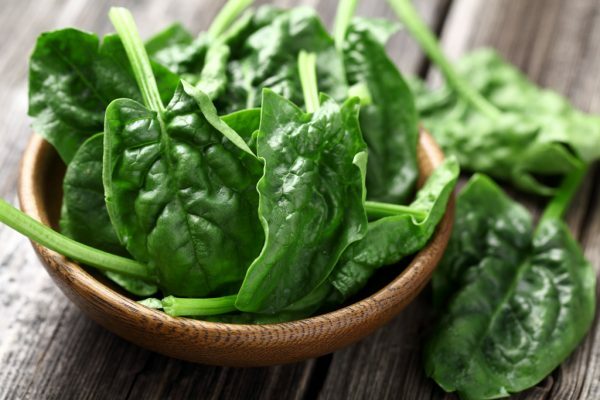 Pair spinach with something with vitamin C to help your body absorb the iron! 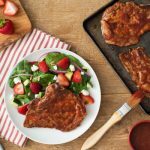 Strawberries with spinach or tomatoes with spinach make a delicious pairing! Even topped with a lemon vinaigrette adds the vitamin C and a great flavour combination. 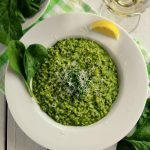 Try making spinach pesto instead of basil-based pesto for a different dimension of flavour and nutrition! For a quick, easy and healthy weeknight meal try sautéing mushrooms and spinach with shrimp and garlic. 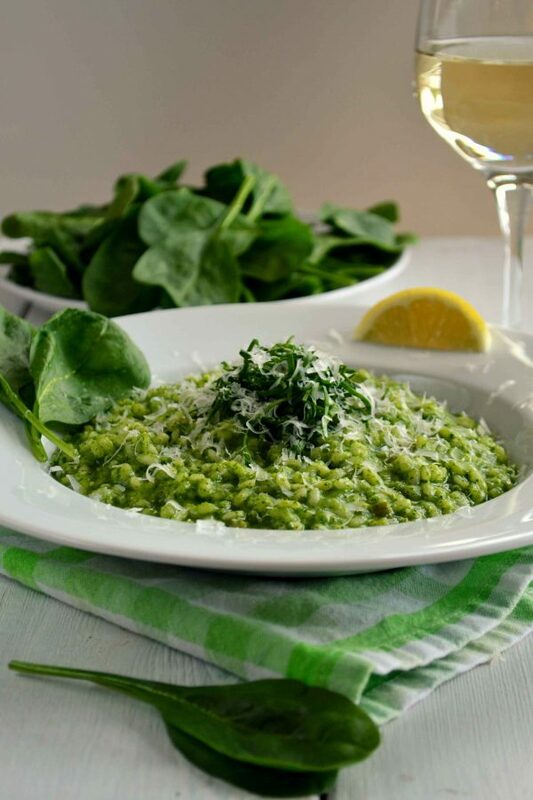 Turn your typical risotto green by incorporating some spinach! Try adding cooked spinach to your scrambled eggs or omelets in the morning. Or serve a poached egg on a bed of velvety cooked spinach! You can also incorporate spinach into smoothies, soups, casseroles and pastas. Spinach will boost your smoothie’s nutrient content and change the colour, without changing the flavour of whatever sweetness you add to it! What a powerhouse! Mix spinach and sundried tomatoes with a creamy cheese such as goat cheese and stuff chicken breasts before baking. 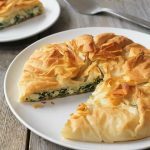 Try our Spinach ricotta pie recipe! Flaky layerswith lots of creamy, spinach goodness! Raw spinach is great in salads and sandwiches. Try making a spinach salad and add cucumbers, tomatoes, strawberries, sesame seeds, a little goat cheese and mix with balsamic dressing. According to the Canadian Nutrient File, 100 g of raw spinach contain a great number of your daily-recommended intake of nutrients: 600% of Vitamin K, 94% of Vitamin A, 88% of folate, 47% of Vitamin C, 31% of magnesium, 19% of iron, 16% of potassium, 9% of fibre (2.2 g), 9% of calcium, and 5% of niacin. What Goes Well With Spinach?